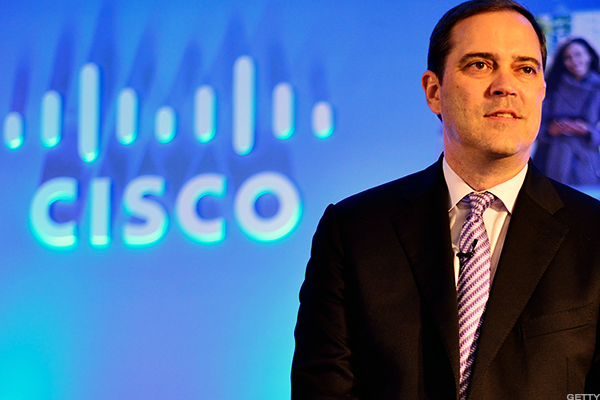 Analysts are hopping on the Cisco stock bandwagon, as the positive catalysts continue to pile up. TheStreet's Jim Cramer also likes the stock. The U.S. stock market is having its first tough start to 2018, with the Dow Jones Industrial Average and Nasdaq both down about 0.5% in early Wednesday trading. There is at least one bright spot in both indices, though: Cisco Systems (CSCO - Get Report) , which is up about 0.25% after the company received a bullish push from the analysts at Piper Jaffray. Analyst James Fish assigned an overweight rating to Cisco and bumped the firm's price target to $44 from $37. From current levels, that implies about 10% upside. "I've got a real good feeling about Cisco," TheStreet's Jim Cramer said on CNBC's "Mad Dash" segment. Part of that good feeling stems from Fish's recent note. The analyst talks about an "under-appreciated cash flow story," as well as the company's transition to a more software-based business model. That's not unlike the recent reasoning behind Bank of America/Merrill Lynch analysts also warming up to Cisco. However, they used a $46 price target, a bit higher than Fish's $44 target. Fish also points out that Cisco could repatriate $48 billion in after-tax overseas cash. In essence, it comes down to those three things: Cash flow, software sales and repatriation. The repatriated cash could go to dividend increases (for which Cisco stock already yields close to 3%), a stock repurchase plan or more M&A, reasoned Cramer, who also manages the Action Alerts PLUS charitable trust portfolio. On a down day in the stock markets, maybe investors should at least look at a stock like Cisco, Cramer said. At the very least, it's one to watch, he added. Cisco stock has a reasonable valuation, good dividend yield and positive catalysts. Shares of Cisco closed at $39.91 Wednesday, up 0.55%.